How do you feel when someone says, “I need this ASAP,” or puts a note on something that includes, “ASAP” as part of the note? Generally, we know that ASAP means AS SOON AS POSSIBLE (and it is in all caps when most people hear or visualize it). There is nothing gentle, easy, or calm about this acronym and its meaning. And we could all use a bit more gentle, easy, and calm in our lives. Life is hard enough without feeling as if you’re under even more pressure to do something ASAP! With this brand-new Get a Plan! Guide®, you are going to add a little gentleness into your life by changing the acronym to ASAR – “As Soon As Reasonable”. How does that sound? Nice and easy. A little calmer. And a lot more practical. By accessing the Get a Plan! 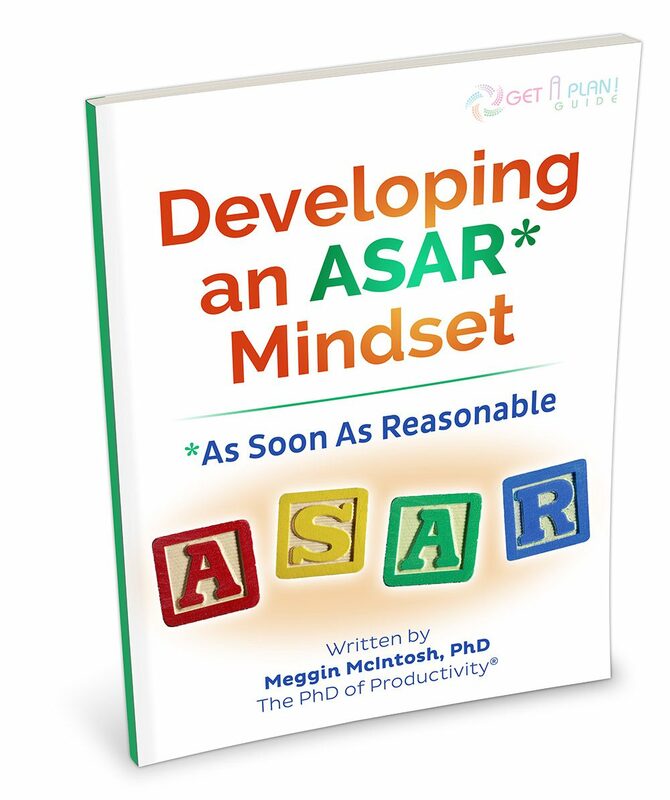 Guide® to Developing an ASAR Mindset – As Soon As Reasonable, you will get the breathing room you need to reduce the stress and add gentle, calm, and ease back into your professional as well as personal life. If you like reading and having a document to refer to, you may purchase and download this 28-page full-color Get a Plan! Guide®. Just click the order button that says PDF. Once you check out through the secure shopping cart system, you will be redirected to a webpage where the PDF is ready for immediate download so you can begin reading and making notes.